Geologic Time: The science of Geology didn't take shape until the discovery of geologic time (deep time). James Ussher, Bishop of Armagh (1581-1656) Calculated biblical Creation of Earth to have been in 4004 BC. 15th and 16th century astronomers had shown that actual observations of nature could yield important new information not found in revered ancient texts. Fossils are found in rocks. 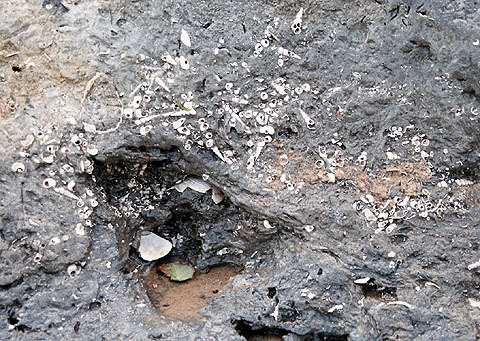 What was a shark tooth doing inside a rock? This led Steno to study how the rocks (which we today recognize as sedimentary) formed. He recognized them to be composed of lithified remains of sediment deposited in layers (or strata) and proposed a set of several principles of stratigraphy by which one could distinguish younger and older sediments. 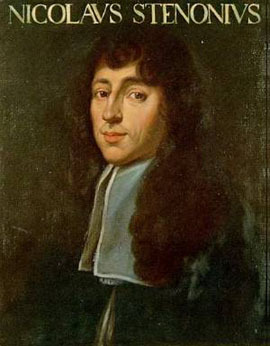 His results were published in De solido intra solidum naturaliter contento dissertationis prodromus (Preliminary discourse to a dissertation on a solid body naturally contained within a solid, mercifully referred to simply as Prodromus) in 1668. Superposition. 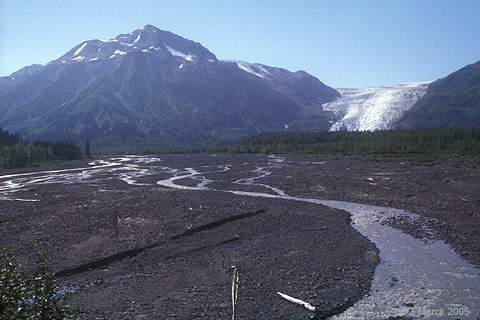 In undisturbed strata, older layers lie beneath younger ones. different rocks formed at different times. Of course, Steno thought that all of this deposition had occurred during the 40 days and nights of Noah's flood. Igneous: Rock that solidify from molten material. 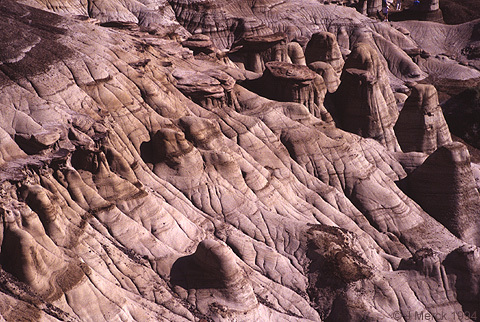 Sedimentary: Rock that are formed from the transported remains of pre-existing rocks. 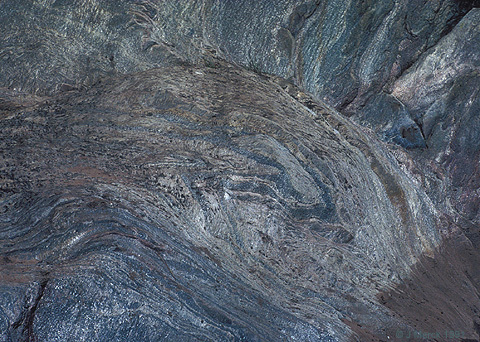 Metamorphic: Rocks that have been chemically altered (in a solid state) by heat or pressure. Prologue: Remember, Steno, a traditionalist, still thought that all of this deposition took place during the flood. In the next stage of the discovery of geologic time, natural historians took up the question of whether the Earth has a long or short history. Catastrophism - maintains that the rocks were deposited in a series of unusual upheavals. This was consistent with the story of the Flood and even after naturalistsbegan to speculate that Noah's Flood may have been only the last in a long sequence of catastrophic changes, remained by default the prevalent mind set. During the 18th century, the naturalists began to question catastrophism. He observed that in the modern world, sediments were still being deposited in separate layers by separate depositional events, even without a world-wide deluge. Cross-cutting relations. If one structure cuts across another, then the one that is being cut must be oldest. Inclusions. 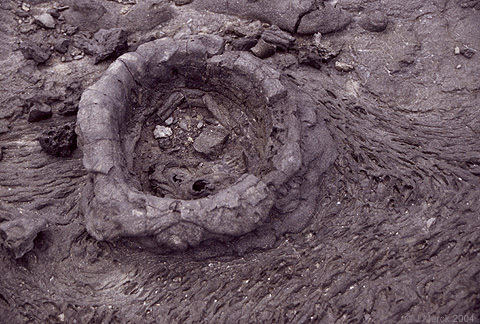 If eroded chunks of one material are incorporated within another, then the eroded material must be older. Hutton had his epiphany at Siccar Point. Which rocks are younger, the ones above or below? Charles Lyell: Intellectual successor to James Hutton. Published Principles of Geology (three-volume set, 1830-1833). The first geology textbook popularized uniformitarianism. The early uniformiatrians went far beyond the philosophy stated above. They also maintained that all geologic processes happened at the same rate in the past as today, and that time was eternal or maybe cyclical. Hutton claimed that the Earth had, "no vestage of a beginning and no prospect of an end." 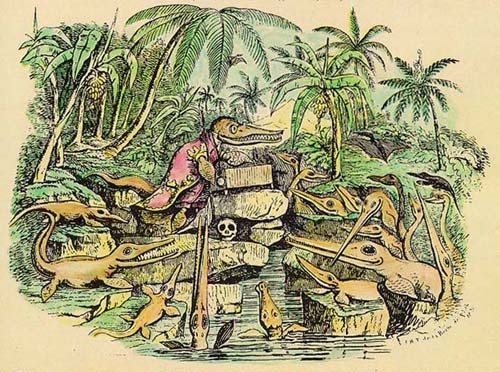 "You will at once perceive," continued Professor Ichthyosaurus, "that the skull before us belonged to some of the lower order of animals, the teeth are very insignificant the power of the jaws trifling, and altogether it seems wonderful how the creature could have procured food." Relative dating: In which the order of the origin of various rock units is determined. Absolute (or numerical) dating: In which an acutal numerical chronologic age is established for rocks. During the 19th century, however, geologists could only establish the relative ages of rock units. The means to do so had already been provided by Steno and Hutton, but only provided rocks could be seen in direct association. In classical antiquity, scholars knew of and were interested in the bones of ancient animals. Roman Emperor Augustus publicly displayed ancient arms and armor plus the bones of "giants" and other mythical creatures at his estate in Capri. During the Middle Ages and Renaissance, learned people considered fossils to be "sports of nature" - mineral assembleages that coincidentally seemed to resemble living things. 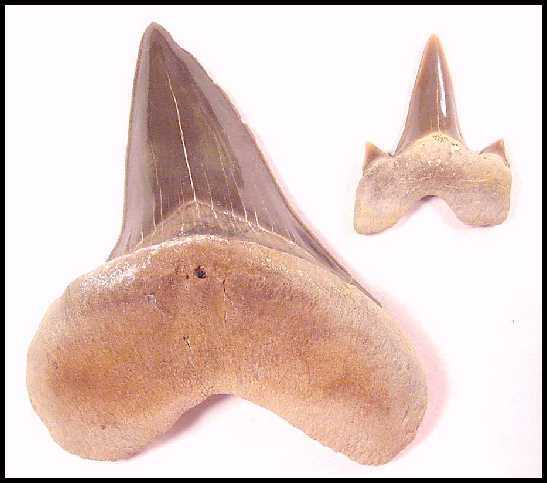 In Prodromus, Steno argued that fossils are the remains of organisms, using fossil shark teeth as example. In 1796 William Smith, a British civil engineer, added a fourth principle: Faunal succession, noting that different groups of fossil organisms were preserved in different rock units. By this means it became possible to say that one rock was the same age as another rock halfway around the world. Index fossils: Fossils of organisms that existed for short perios of geologic time but were geographically widespread. Example: Ammonites, Shelled cephalopods that evolved quickly (so each species lasted only a few million years, but whose remains were distributed worldwide in many environments. E.G. 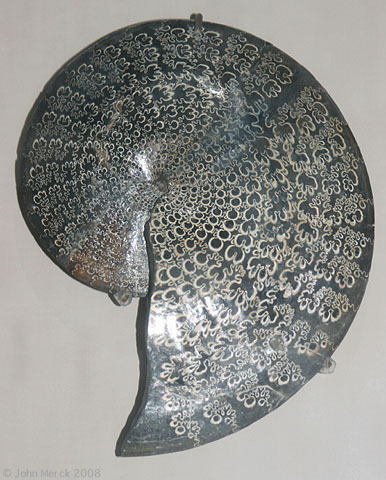 : Sphenodiscus lenticularis - an ammonite. Facies fossils: Fossils of organisms that endured for long periods of geologic time but were linked to a specific environment. Example: Lingula, a brachiopod living only in lagoonal mud-flats that has changed very little in the last 500 million years. E.G. Modern (left) and ancient (right) examples of the brachiopod Lingula. Of course microscopic index fossils can be superabundant, even in small rock samples, so they are particularly useful. Descriptions of fossil life found in them (E.g. Eocene - "Dawn of the recent"). But note: Geologists may have figured out that a Triassic rock were older than a Cretaceous rock, but they didn't know how old either rock was in years. To be an educated person, you must memorize the following from the simple version of the Geological Time scale. All eon names and their correct sequence. All era, and period names of the Phanerozoic Eon and their correct sequence. The absolute ages of the beginnings of each of the eras of the Phanerozoic Eon. James Ussher and his biblical estimate of Earth's age.